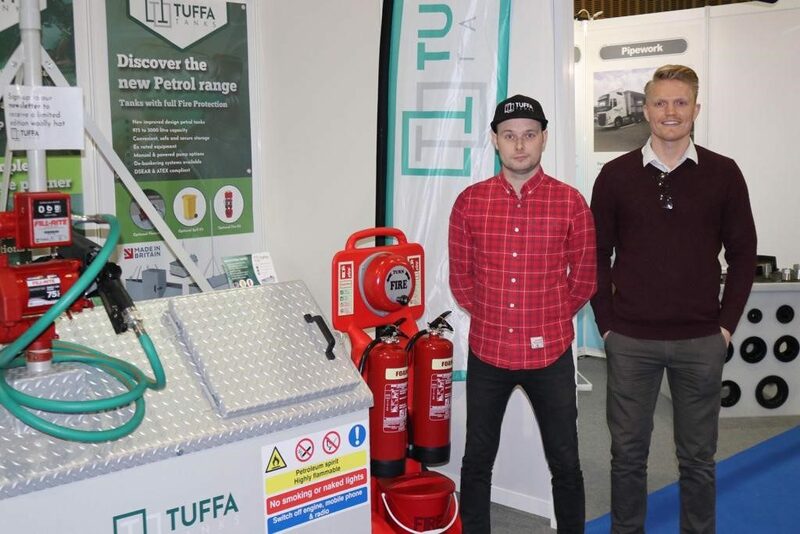 This month saw one of the premier events in the fuel industry calendar, with Tuffa at APEA Live at Stadium MK in Milton Keynes. The Association of Petroleum and Explosives Administration (APEA) was founded in 1958 and is a UK based organisation with members from the petroleum industry, including Regulators from National and Local Government Authorities, oil companies, equipment manufacturers together with suppliers, service and installation companies. The APEA brings the industry together and works for a safer environment. APEA Live is a unique three part event comprising of an exhibition and conference during the day together with a glittering awards dinner in the evening. The event is a showcase of the greatest achievements and the latest new products and initiatives. It brings the fuel industry together to celebrate the sector’s successes. 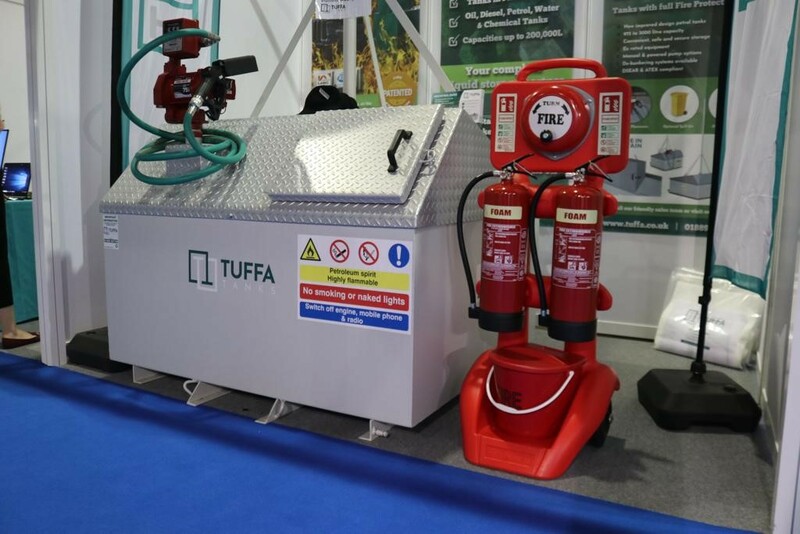 Tuffa UK were at the exhibition showing this year’s newly designed range of petrol storage tanks. The product has been totally redeveloped with new features and a new silver steel finish. The new range of fire-protected petrol tanks provide safe, secure petrol storage and dispensing. Manufactured from high-quality mild steel they have a service life in excess of 30 years. 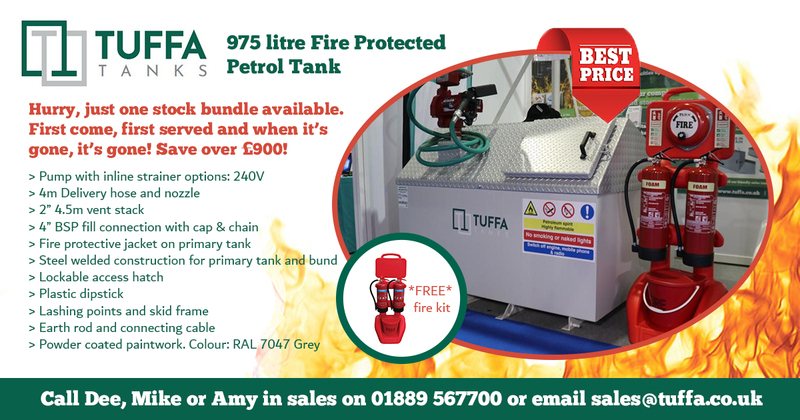 We currently have our show 975 litre petrol tank in stock, together with the dual extinguisher fire-point kit displayed on the stand as a special ex-show bundle offer. The tank features integral factory-fitted fire-protection, a 4″ BSP fill connection with cap and chain, lockable access cover with a delivery hose and nozzle. You can save over £900 on list price and enjoy free delivery. Tuffa “Highly Commended” at APEA Live! After a successful exhibition during the day, Tuffa’s James Shenton and Mike Bailey got suited and booted ready for the evening awards ceremony, hosted by former Top Gear presenter Quentin Wilson. 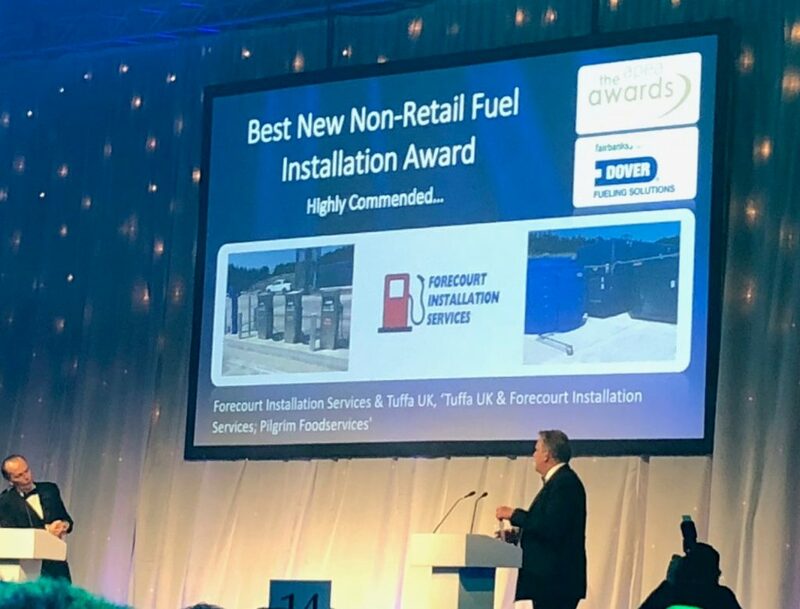 Tuffa had been shortlisted in one of the award categories, the Best New Non-Retail Fuel installation. This was a joint entry with our install partner, Forecourt Installation Services Ltd for a project we carried out for the food wholesaler, Pilgrim Foodservices. 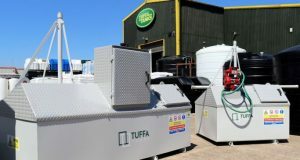 They required an 80,000 litre bespoke steel diesel storage tank and a 10,000 litre plastic AdBlue tank to cover the daily fuelling requirements of their fleet of 60 delivery vehicles. You can read more about this project here. Tuffa UK was runner up in this category, being “Highly Commended” by the judging panel for our work on this project. Tuffa UK General Manager, James Shenton was understandably delighted to receive more industry recognition. “It’s a tremendous achievement to receive this prestigious recognition from one of the most respected trade bodies in the industry. Coming just a month after we were winners of The Employer of the Year Award at the Burton Mail Business Awards, it really is a fitting testament to the dedication and hard work of the entire Tuffa team,” he said. For price and technical information on any of our product range, call Dee, Amy or Mike on 01889 567700 or contact us here.